I finished quilting the Which Way? quilt the other day. 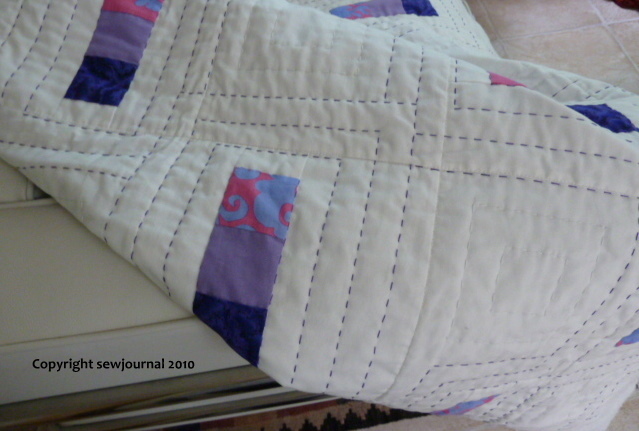 I added white stitching to the empty spaces and a paler purple around the edge of the coloured rectangles. If you click on the photos you’ll get a larger one where you can see the detail. Now I have to find a suitable binding. I’m contemplating either a multi-coloured one or a dark purple one. What do you think? This is your last chance to participate in my contribution to the Sew Mama Sew Give-Away. My give-away is a totally hand-sewn pin cushion. Click here to enter. I agree with Crispy – go for something purple. 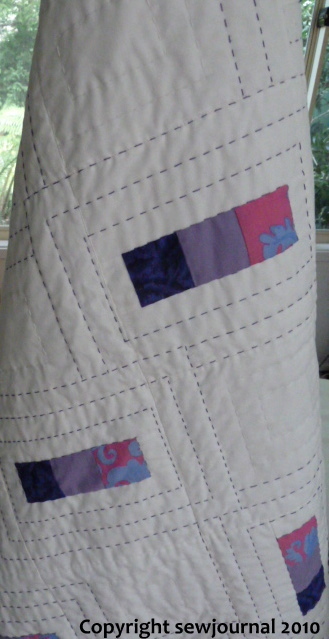 Lovely even quilting stitches, BTW! Well so far it looks like we are all in agreement. I think the dark purple would set everything off beautifully. Oh, either way will be fine…..just go ahead and send it to me unbound and I’ll finish it up………..lol. It is beautiful, Munaiba, and I think I vote for the purple, too! It is wonderful!!! I love it.